This page should be updated due to game changes. Reason: Ascension updates changed leadership and mining support ship roles. 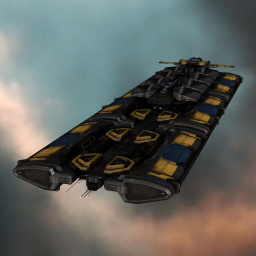 The Orca is designed to support a mining fleet with its command burst modules. it can fit three command burst modules without help from rigs allowing single Orca to give all the necessary mining boosts to a fleet. While designed as a powerful fleet booster for mining operations, the Orca also gets much use as a general freighter. It has a sizeable ship maintainance bay that can be used to store assembled ships, an ore hold, a fleet hangar and normal cargo hangar. The ship maintainance bay especially separates the Orca from other subcapital industrials as it can move assembled ships up to battlecruiser size in it. The fleet hangar is also useful in mining fleets as the fleet members can be given direct access to this hangar. With the maximum configuration of cargo expanding modules and rig calibration, the Orca's standard cargo hold can grow to up to an approximate of 87,000 m3 dependent on skills, but at a significant loss to EHP. A more reasonable fit with a Tech 2 Damage Control puts it into a range of 60,000 m3, still enough for a packaged battleship. More about the Orca and its various roles is listed in the Orca Guide. Flying the Orca, and developing the best skill set to do so is perhaps the biggest improvement in a high-sec mining fleet. While the Orca has a large cargo bay, and a separate ore bay, one of its best uses is giving mining fleet members a longer mining laser range, and a faster mining laser cycle time through the use of Command Burst modules. This leads to more ISK per hour of mining for all fleet members. Mining Foreman and Mining Director provide an effective skill set for Orca operations. These skills assist fleet members in mining yield improvements. Mining Foreman links in the high slots complete the mastery of the Orca, providing mining laser range improvements and faster mining cycle times as an integral improvement to a mining fleet. Another way to support mining ops would be to train Drones V to fly a full wing of five drones from the Orca. Depending on the situation you will want either combat drones (to kill belt rats), ECM drones (to counter potential gankers) or mining drones to mine ore. Note that, in order to use heavy ECM drones, you will need Electronic Warfare III and Advanced Drone Avionics III. Miners in the fleet can have direct access only to the fleet hangar bay. The Orca pilot must move ore from the fleet hangar bay to the ore hold or the cargo bay when the fleet hangar gets too full. Typically, it’s good practice to place mining crystals, both T1 and T2s in the fleet hangar, so the fleet can have access to new ones when theirs burn out. This takes up just a little of the fleet hangar. The mining fleet can use the Orca's ship maintenance bay to reconfigure their mining ship, swapping out fittings for different purposes. To enable this, the Orca pilot must configure the Orca to allow this access. This is done by the Orca pilot right clicking on the Orca, clicking on the Configure Ship menu item, and clicking the “Allow Fleet Member Usage” box. The use of the Orca is not limited to having large cargo and ore bays. A mining tactic to use when in a can flipping area is to have frigates or cruisers stored in the Corporate Maintenance Bay and have your fleet swap your mining ships for one of these. A can flipper will look twice if, after he flips your can, several cruisers, a logi, and a tackler suddenly appear. To do this, the mining ship must be within 2500m of the Orca. This coupled with a decent drone bay, will protect a mining fleet from random pirates, while allowing a decent time to get “The Cavalry” to protect your mining fleet. A note on ship swapping, Combat ships can have nothing in their cargo bays except ammunition. Miners can have nothing in their cargo bays except mining crystals. Prior to docking, miner should jettison all ore and other articles, and the Orca's tractor beam can haul the cans to the Orca and put the jettisoned cargo away. Before the Rhea release in December 2014, ships stored in the Ship Maintenance Bay could not drop and were simply destroyed if the Orca was destroyed. This is no longer the case and ships have a chance of dropping, just like any other "container". If a ship isn't destroyed, it'll drop fully intact (including everything fitted or carried in the ship; rigs, modules and cargo). While the ships can drop, it is still impossible to scan past the first "layer" of the the Ship Maintenance Bay, so people can see what ships you have in there but are unable to see how those ships are fitted or what charges and ammo they might have in their cargo holds. As such it's possible to hide expensive modules on ships in the Ship Maintenance Bay. Just remember that they can still drop and will show up on your lossmail. ^ In older material you may see references to the Orca's secondary cargo areas as being "unscannable". Prior to the Retribution expansion, the corporate hangar (now called the "Fleet Hangar") in the Orca could not be scanned by players and did not drop its contents on destruction, making it a secure way of transporting high value items around high sec. As of the Retribution expansion, all the cargo bays of the Orca can be scanned and drop contents just like the normal cargo bay, so this advantage is gone. This page has been accessed 367,740 times.